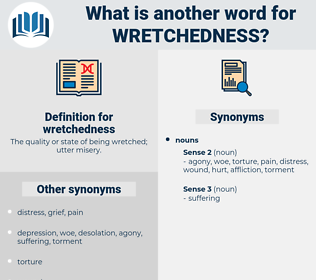 What is another word for wretchedness? 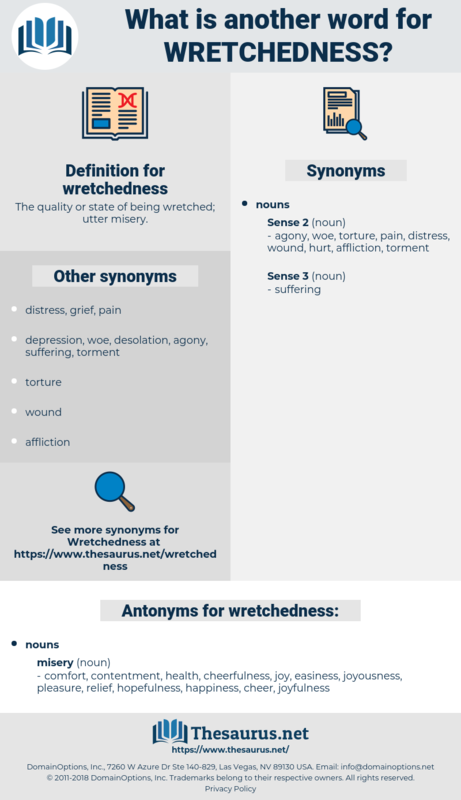 The quality or state of being wretched; utter misery. destitution, squalor, hardship, deprivation, poverty. comfort, contentment, health, cheerfulness, joy, easiness, joyousness, pleasure, relief, hopefulness, happiness, cheer, joyfulness. Their wretchedness I was soon brought face to face with. Leaning her head upon the table, she forgot all but her own wretchedness, and so did not see the gayly - dressed, haughty - looking lady who swept past the door, accompanied by Guy and Dr. Holbrook.